After his first appearance in Charles Dickens’ debut novel The Pickwick Papers, Sam Weller became something of a cult favourite. From starting out working at The White Hart Inn, where the titular bumbling hero stopped off one night, Dickens made him Mr Pickwick’s personal servant and companion – providing a certain amount of commonsense thinking and Jeeves-like initiative to help the less worldy-wise gentleman as he travelled the country. 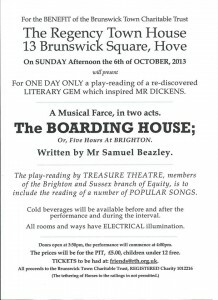 When Brighton actor Nigel Nevinson was researching his one-man play The Trials And Tribulations Of Mr Pickwick – as performed at this year’s Brighton Fringe – he discovered Weller had a similarly down-to-earth antecedent in an 1811 play, The Boarding House by Samuel Beazley. 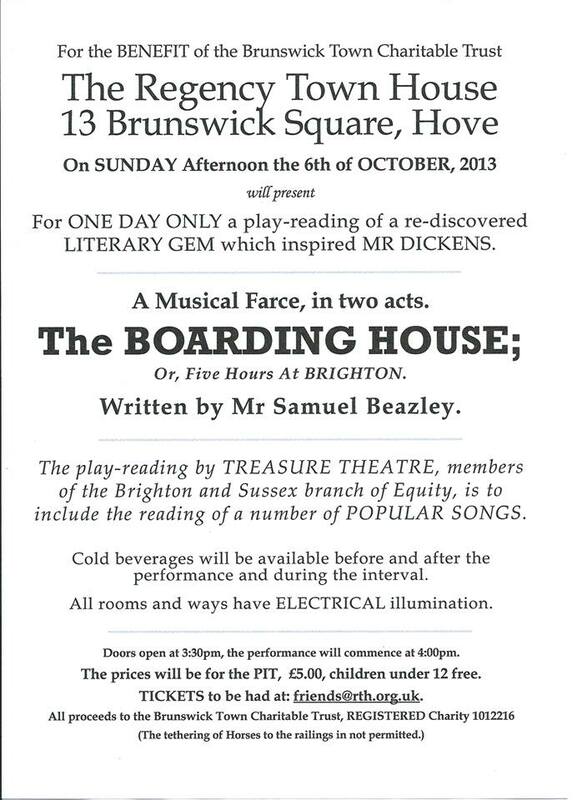 What piqued Nevinson’s interest in the play was the discovery of an 1812 playbill which revealed the play’s subtitle: Five Hours At Brighton. Further investigation showed the titular boarding house’s location to be on the city’s North Steine. Now Nevinson is playing boarding house owner Peter Fidget as part of a 14-strong Brighton-based cast reading the play more than 200 years on from its first performance. The show is designed to help raise money for the Regency Town House and increase interest in further stagings of the rediscovered farce. “There’s a lovely song all about Brighton which shows how the city hasn’t changed in 200 years,” says Nevinson, on the way to London to see a picture of original Sam Weller actor Sam Vale at the National Portrait Gallery. The play reading is set to be the first of many using actors from Brighton’s Equity group. “We’ve been talking about starting a play-reading group for a while and thought this would be a great one to start with,” says Nevinson. As this is only a staged reading using a text Nevinson found in the British Library, the songs will be spoken rather than sung, especially as the original music is currently lost. The play even includes a song about the Berners Street Hoax, which grew out of a bet that Beazley had with his friend Theodore Hook about turning a private house into the most talked-about address in London. “Someone sent invitations to shopkeepers and hairdressers to go to a certain house at a certain time,” says Nevinson. “The lady who lived there was flooded out with people! “Samuel Beazley wrote more than 100 plays and was also an architect who designed five theatres in London – two of which [the Lyceum and St James’s Theatre] are still in existence.